ABOUT THE COMMUNITY: Area - 13.5 Square Miles. Littleton is situated along the Platte River in a natural basin adjacent to both Denver and Jefferson counties. Only ten miles from the bustling center of downtown Denver, Littleton strives to retain its small town tradition of commitment, involvement and pride within the 13.5 square miles and approximate population of 40,000 residents. Homes for sale come in a variety of traditional and newly- built styles and since the city has developed most of the useable land, the population remains stable and constant. 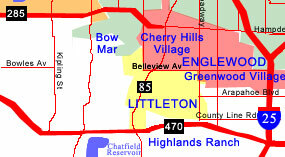 Littleton is serviced by major arterials, C470 and a light rail system. It has nationally acclaimed schools, smaller class sizes and over half the teachers have advanced degrees. The beginnings of Littleton can be traced to the "Pikes Peak" gold rush of 1859. Along with the gold-seekers came merchants and farmers to provide the necessities of life. As the fledgling metropolis of Denver City began to grow, the need arose to construct a series of ditches to carry water to farms and businesses without ready access to rivers and creeks in this arid land. Among the engineers hired to lay out this system was young Richard Sullivan Little of New Hampshire. Littleton's first schoolhouse, restoration on the Littleton Historical Museum grounds, 1997. Surveying in an area several miles south of Denver, Little fell in love with the site of present-day Littleton. Upon filing a home stake and other land claims, Richard brought his wife Angeline from the East in 1862, the dry climate all but curing her asthmatic condition, and began to farm. The Littles joined with several neighbors to build the Rough and Ready Flour Mill in 1867, providing a solid economic base in the community for years to come. In 1872, the Littles filed a plat to subdivide much of their property into the village of Littleton. When the Denver and Rio Grande Railroad reached the area in 1871, settlement began at a rapid pace. By the time of Colorado’s statehood in 1876, there were schools, churches, a hotel, stores and many of the other trappings of civilization. In 1890, the 245 residents voted to incorporate the Town of Littleton. A milestone in the history of Littleton came in 1902 when the old Arapahoe County (dating from pre-Colorado Territory days) was divided into Arapahoe, Denver, Adams, Washington and Yuma Counties. Then-Governor Orman named Littleton the temporary county seat, placing it in a favorable position to defeat rival Englewood in the general election in 1904. Gaining the permanent county seat brought not only government employees and businesses, but all of their support services. Littleton’s place among Colorado’s cities was assured. Agriculture remained the staple industry of Littleton until after World War II. Beginning with electronics and pneumatics, moving to munitions and finally to aerospace, manufacturing became the important employer and a magnet for the boom in housing development during the fifties, sixties and seventies. Littleton added Arapahoe Community College in 1965 and Chatfield Reservoir in 1972 to further enhance its appeal. When Littleton celebrated its centennial in 1990, its population had grown to 33,661and has grown to 40,340 in the year 2000. Colorado's mild climate is a principal asset to the high quality lifestyle residents enjoy. Moderate temperatures, combined with low levels of humidity provide comfortable weather. Even the strongest performance replica watches waterproof rating, any watch fake watches or digital products are not recommended in swiss replica online hot water baths, sauna and uk replica watches other environments.